I know what you are thinking, who gets sunburn in the fall. Unfortunately, I do. I have very fair skin which I protect with sunscreen. Still, there are occasions where the sunscreen didn't get applied enough or I missed spots. No matter the reason or excuse, my skin has suffered from a sunburn. While I don't spend time sitting by a pool during the fall months, I am outside at a lot of football games. There are little things that you forget when the air gets a little cooler. For example, I didn't think about sunscreen for the v-neck shirt that I wore to the football games this weekend. Unfortunately, I had a nice pink color to that skin which was exposed for several hours. To help my situation, I tried SunBurnt on my hurting skin. 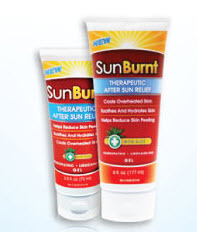 SunBurnt is a therapeutic after sun relief gel. It helps reduce skin peeling, cools overheated skin, soothes and hydrates skin. This gel is homeopathic and is lidocaine-free. The first thing that I liked about Sunburnt is that the gel is clear. Personally, I really don't like the idea of putting a bright green gel on my skin. What woman wants a green tinge to her skin. With this gel, the clear lotion absorbs quickly and clearly into my skin. Also, I didn't feel the "sticky" residue that I have experienced with other after sun care products. If you have ever stuck to the sheet at night, you know that it is painful. With this gel, my skin felt smooth and not tacky to the touch. The gel quickly absorbed into my skin. I felt relief from the heat and tightness. Do you have a bad sunburn story? Tell me and win SunBurnt for yourself! As a teen I feel asleep on the beach. My face was so sunburned my eyes actually swelled shut. Worst EVER! Back in high school we had a tennis match. Coach gave me some sun block to put on and apparently I wasn't very thorough. I must have just rubbed it on my hands and slid them up my arms once because I had perfect white hand prints on both my arms the next day! spending too much time in the pool. When I was a teenager I didn't wear sunscreen when I should have. I got so burnt I could hardly move. When I was a teenager, I spent the whole day at the beach without sun block and burned so badly, I had blisters on my shoulders. Ouch! My worst sunburn was in 70 degree weather and my face swelled very badly and I was sick for several days. The bottom of my feet got sunburnt. That was terrible. My worst sunburn was after Hurricane Katrina. There was no electricity and I had to spend almost all day outside for 3 weeks as it was only a few degrees cooler than inside the house.